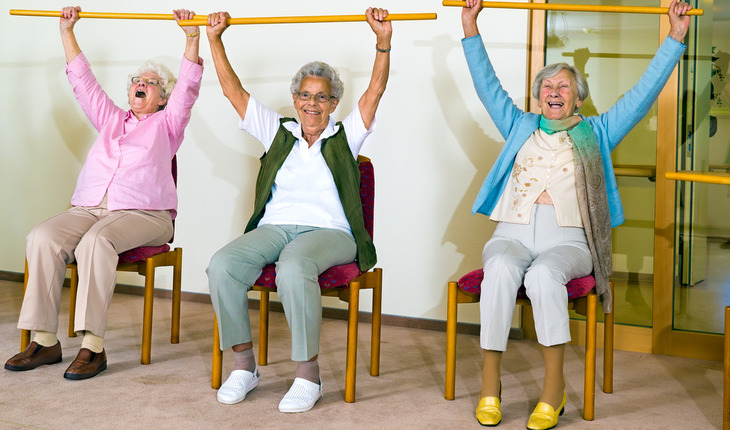 If you needed on more reason to get up off the couch, here it is: Exercise may be associated with a benefit for elderly people who already have memory and thinking problems. That’s the finding of research published in the October 19th, 2016 online issue of Neurology, a medical journal of the American Academy of Neurology. OK, maybe you don’t already have any cognitive decline. But why not hedge your bets and get moving a a preventive measure! A release from the academy explains that the research involved people with vascular cognitive impairment, which is the second most common cause of dementia after Alzheimer’s disease. In vascular cognitive impairment, problems with memory and thinking skills result from damage to large and small blood vessels in the brain. The study involved 70 people with an average age of about 74 who had mild vascular cognitive impairment. Half of the participants took part in one-hour exercise classes three times a week for six months. The other half received information each month about vascular cognitive impairment and a healthy diet, but no information on physical activity. Those who exercised also improved compared to the other group in their blood pressure and on a test of how far they could walk in six minutes, which measured overall cardiovascular capacity. These findings are also important to note given that high blood pressure is a risk factor for developing vascular cognitive impairment. Liu-Ambrose said more studies are needed to determine whether exercise can improve thinking abilities in people with mild vascular cognitive impairment. Because the study sample size was based on detecting a difference on the overall thinking skills test, large samples might be needed to detect differences in specific thinking abilities, such as planning, and everyday skills, such as managing one’s finances.